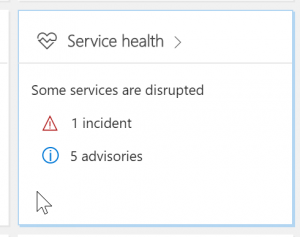 Microsoft Service Health notifications are an important part of keeping track of the health of Office 365, the individual services, and the Microsoft datacenter infrastructure. But you also need to monitor your own network infrastructure, your egress points, your ISPs and everything in between. Exoprise integrates the Office 365 Service Health notifications and messages throughout its product; from dashboards to email forwarding and webhook notifications, you’ll be able to ensure that your teams are up-to-date with the latest 360-degree view of your mission critical cloud services. While Microsoft does a great job of communicating the real-time status of the Office 365 and dependent services you’re still on the hook to make sure your network and infrastructure is operating well. Exoprise CloudReady makes it easy to see – in one place – how YOUR networks are performing and how Microsoft’s Office 365 datacenter and services are performing. No management packs to install, no rights to give away. With a few clicks and and an OAuth registration, CloudReady can give you deep insight into the health of Office 365 and all of its applications and services. Subscribe to and distribute up-to-date Office 365 Service Health Messages via Exoprise CloudReady. By leveraging your one-time OAuth registration, CloudReady can filter, forward and disseminate service health and status updates to your enterprise email recipients so everyone can stay informed including your helpdesk, network and service administrators. 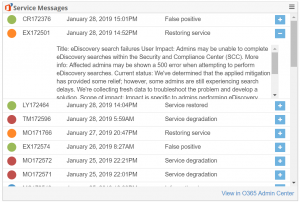 Know ahead of time and then check your CloudReady active monitoring to see if there really is a problem affecting your tenants. Utilizing the same single OAuth registration, CloudReady can integrate real-time service health and notifications into any of your existing management systems. Real-time publishing of notices and status message through configurable web hooks takes only a few minutes. No servers to deploy, no polling to configure and maintain. To open the service health status in the admin center, go to Health > Service health or click the Service health card on the Home page within the admin portal. The health of each cloud service that is part of Office 365 is shown with icons indicating the service’s health. Office 365 service health is also available the Office 365 Admin App and push notifications. The best alternative is use Exoprise CloudReady and an end-to-end view in one place for complete SaaS and network intelligence. Currently, Office 365 Service Health access requires the global admin or service administrator role. For viewing Exchange Online, SharePoint, or Skype for Business and Teams admins to view service health, they must also be assigned the service administrator role. When using CloudReady integrated Office 365 Service Health, users don’t require role adjustment or access. By accepting and assigning OAuth access for CloudReady to query the per-tenant service health messages and status, you can enable any user with rights to CloudReady the ability to see real-time views into the Microsoft Service Health. Additionally, the messages and notifications can be distributed to email list groups and published through webhooks. Delegating OAuth access to CloudReady requires the administrative role but that only needs to be done once for your CloudReady tenant. 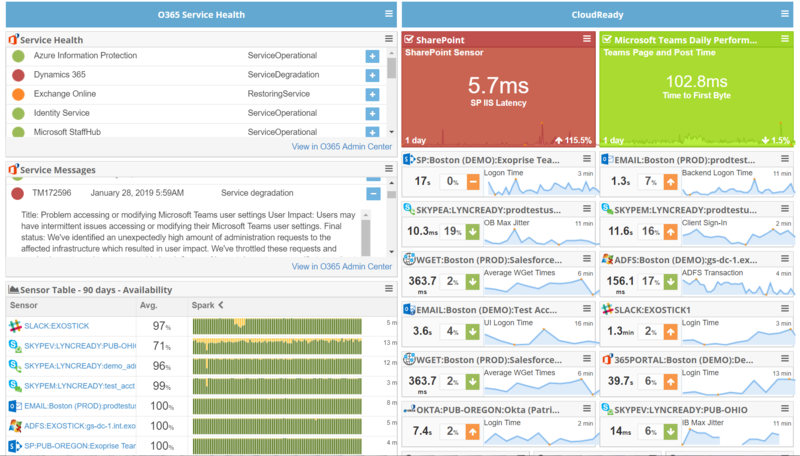 Finally, the CloudReady dashboards can be embedded into any network operations console or even a SharePoint or Intranet page so that the service health status and notices can be shared with anyone. Read more about dashboard embedding.